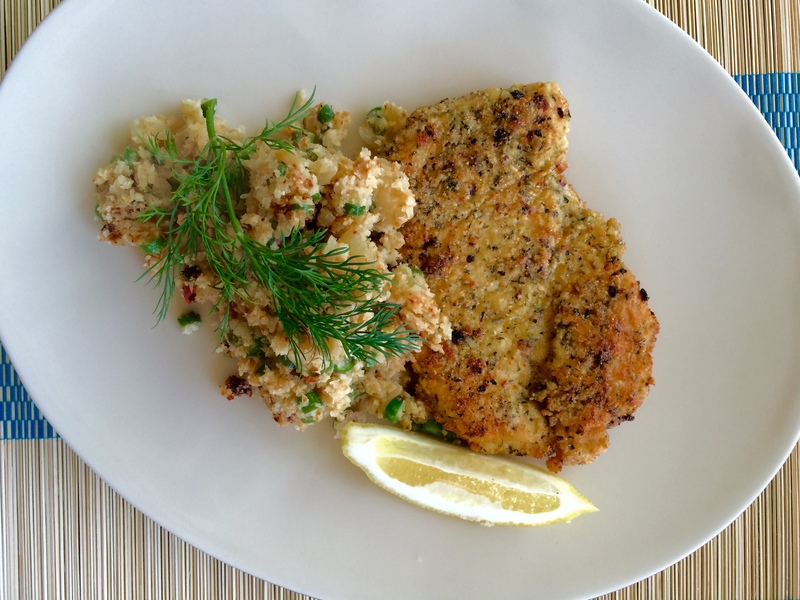 This is the first ever chicken schnitzel I’ve ever made and it knocked my socks off – sensational is an understatement – and a meal for four with this beautiful cauliflower fried ‘rice’ was about $4 per person. Beautiful nutritional meal on a budget! Remove the florets from the stalk of the cauliflower. Pulse in a food processor until a fine meal, like rice. Heat the grape seed oil in a deep, heavy based frypan to a medium heat. Gently fry the garlic and cauliflower on a medium heat, stirring frequently for about 15 minutes. As it starts to gently brown, add all the other ingredients and cook for another 5 minutes till the beans are soft. While the ‘rice’ is cooking, prepare the schnitzel. Combine all the dry ingredients in a bowl and combine well. Mix the egg and water in another bowl. Heat the oil in a non-stick fry pan to a medium heat. Dip each schnitzel into the egg mixture and then into the herby crumb mixture, coating well. Place gently into the hot oil. I put two in at once. Careful not to overcrowd the pan. Cook for about four-five minutes on each side until it’s crispy and brown. Turn over for about three minutes on the other side. Place in a warm oven on greaseproof paper until the other two are cooked. Serve with a wedge of lemon and a sprig of dill.